JACKSONVILLE, Fla. (Feb. 25, 2019) — The Junior League of Jacksonville will bring its 28th Annual Whale of a Sale to The Jacksonville Agricultural Fairgrounds and Expo Center, March 1 and 2, 2019. 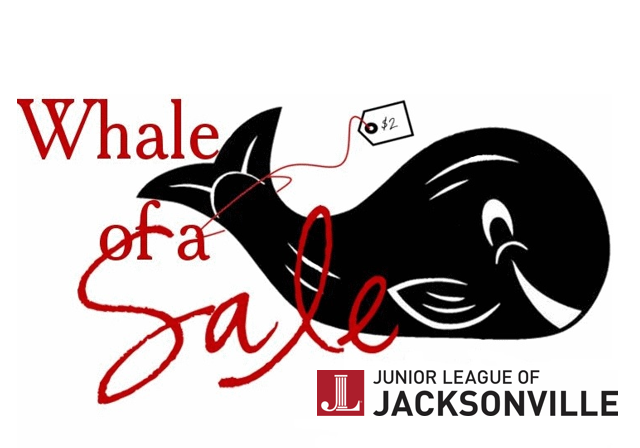 Whale of a Sale is the Junior League of Jacksonville’s largest fundraiser, held annually every spring. The resale event will feature quality pre-owned quality furniture, antiques, electronics, clothing, books, kitchenware and more. Patrons can also find one-of-a-kind deals on wedding merchandise and holiday décor. Whale of a Sale will kick off Friday, March 1 with a Preview Party featuring drinks, dancing and deals! The Preview Party provides an opportunity for shoppers to grab the best deals and avoid the Saturday crowd. Shoppers get first opportunity to purchase items in the Sale but pay twice the listed price. There are three ticket options: General Admission for $40, early admission VIP tickets for $50, or for the ultimate experience, purchase a table for eight people for $500. Tables come with perks such as early admission, reserved seating and recognition during the event. Preview Party goers will be able to dance the night away to the music stylings of Brett Bass and the Melted Plectrum, enjoy Italian-inspired cuisine and an open bar, and also take part in a silent auction featuring jewelry, vacation offerings and more! Saturday will also be a great time to go shopping! For just $2 per person for admission and $5 for parking, bargain shoppers will find many treasures at a reasonable price. The Sale begins at 8 a.m. on Saturday and concludes at 1 p.m.
All proceeds from Whale of a Sale will support the Junior League of Jacksonville’s mission of developing the potential of women and improving the community. Its current community projects, include: Fresh Minds and Kids in the Kitchen, making nutrition education and affordable healthy foods available to Jacksonville’s food insecure residents; C.A.R.E.S. (Caring Assistance Resource Education Support), focusing on enhancing education and literacy opportunities; and Done in a Day, filling short-term volunteer needs for local organizations. For more information or to purchase tickets, visit jljacksonville.org/events/whale-of-a-sale. The Junior League of Jacksonville is an organization of women committed to promoting voluntarism, developing the potential of women and improving the community through the effective action and leadership of trained volunteers. Its purpose is exclusively educational and charitable. During its rich 95 year history, the Junior League has contributed over 1 million hours of service to our community and founded countless institutions in Jacksonville. For more information on the Junior League of Jacksonville and how you can become involved, visit www.jljacksonville.org.